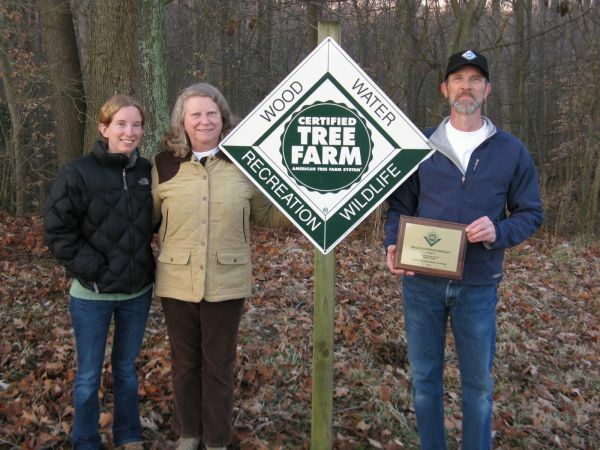 The Maryland Tree Farm Committee and the Maryland DNR Forest Service announced the selection of Paul, II & Judi Sellers and Paul, III & Daisy Sellers as the Calvert County Outstanding Tree Farmers of the Year for 2014. The Sellers own and actively manage a 82.2 acre Tree Farm in Port Republic, MD and have been enrolled in the Tree Farm program since 1977. The American Tree Farm System is a national forestry program, educating forest landowners on the best ways to manage their forests and recognizing them for their hard work and dedication in sustainablely managing their forests. The Sellers manage their forest for timber production, wildlife habitat, hunting opportunities and to protect rare or endangered species. A 50-acre selective harvest was recently conducted, removing a portion of the hardwood trees on the property while leaving an adequate number of trees to re-seed and re-grow the forest. The harvest also improved wildlife habitat by opening up the canopy, allowing sunlight to reach the forest floor and encouraging new growth that serves as a source of food for several wildlife species. In addition to managing their property, the Sellers are strong supporters of agriculture in Calvert County, having raised Texas longhorn cattle on their property, along with several horses. They were also named the 2002 Calvert County Soil Conservation District Cooperators of the Year. Congratulations to all of the Sellers! 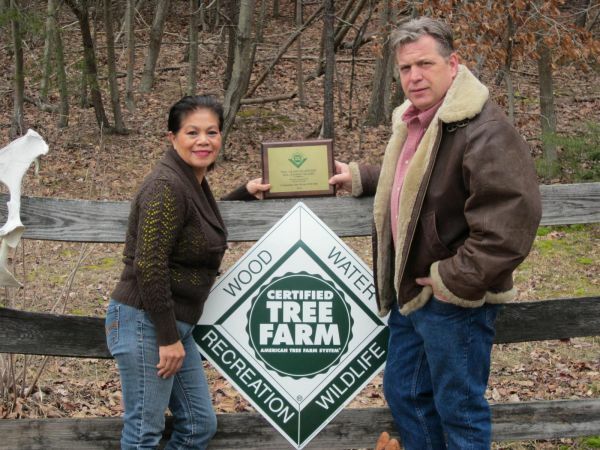 The Maryland Tree Farm Committee and the Maryland DNR Forest Service announced the selection of Patricia & Bruce Bradley as the Calvert County Outstanding Tree Farmers of the Year for 2012. The Bradleys own and actively manage a 44.6 acre Tree Farm in Huntingtown, MD and have been enrolled in the Tree Farm program since 1990. The American Tree Farm System is a national forestry program, educating forest landowners on the best ways to manage their forests and recognizing them for their hard work and dedication in sustainably managing their forests. The Bradley's manage their forest for timber production, wildlife habitat and passive recreation activities. Mr. Bradley has been a strong supporter of forestry in Calvert County, having served 16 years on the Forestry Board. Congratulations Patty and Bruce!